here a video to repair a user STEP model which was a difficult user case. Last edited by easyw-fc on Sat Jul 07, 2018 7:47 pm, edited 1 time in total. Whow Maurice, very nice that you explored the tools under the hood of FC0.18 and put them together in a "workbench"(?). Please let me know how you closed the holes with faces. Is it the OpenSCAD tool I used in my vid? I find the tool very nice to delete one or more faces out of a bunch of faces. all the operations I did in the video came from the defeaturing macro. Please feel free to give feedback here or open any issue at my GH repo. I understand and that was clear to me. But what is behind (inside of your macro), for example to create the face out of the curves? your defeaturing-wb isn't available over the addon-manager. I hope that it will be added soon. One question. I tried to close the face on the front side but didn't succeed. Any idea which existing tool work for this case? Workbenches installed that way will be availible only to you, and not to the other users of your system. But it will not require any administrator or superuser privileges. Copy or move the folder containing your workbench to the "Mod" directory that lies inside your FreeCAD user directory. On Windows, it will be something like C:\Users\your_user_name\Application Data\FreeCAD\Mod, on Linux systems it will be ~/.FreeCAD/Mod where ~ is your user's home directory. On Mac OSX the "Mod" directory should be ~/Library/Preferences/FreeCAD/Mod. One way to get to the FreeCAD preferences directory on Mac is to use the Finder menu item Go->Go to Folder... and then enter "~/Library/Preferences/FreeCAD". But what is behind (inside of your macro), for example to create the face out of the curves? mainly is based on Part WB basic tools. Please let me know your testing results. Now you can install it through the FC 'Tools' 'Addons' menu. 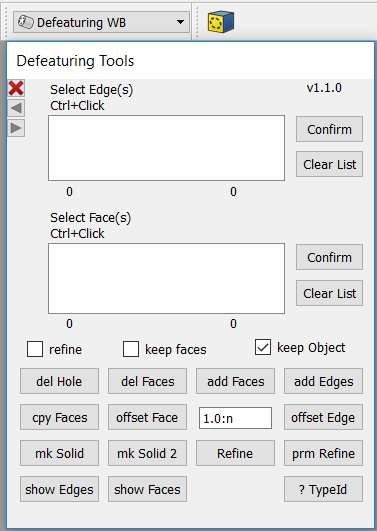 I added a new feature: Face cleaning which allows to remove internal holes or merge adjacent faces.